It happens to every writer now and then — you know, when you’re convinced beyond a shadow of a doubt that your story is absolute crap and you have to toss every single word and start again, or come up with a different idea, or just bag it entirely. I hit that wall this past week, while working on my wip. It hadn’t been a good week anyway, so sitting there with my notes, realizing all of the story flaws, hit me with the force of a near panic attack. How had I allowed things to go so horribly astray? What could I possibly do to right them again? I used the temp-toss approach. To do this, you’ll need to open your mind and be willing to throw away a lot of ideas–and sometimes a lot of work. Here’s what you’ll need, and what you’ll do. 1. Take out a clean piece of paper, and draw a line down the center. 2. On the left, write down only those story elements you absolutely MUST retain. I honed in on significant plot points, theme, and several of the characters and their traits. In the end, this list was far simpler than I original thought it would be. 4. Now, try to link them. Use pencil. If you find yourself creating loopy logical connections to get something to fit or writing fine print for yourself to make a connection clear, you know you’ve found a trouble spot. 5. One at a time, decide which of the trouble spots are worth saving. Understand why they’re important to the book. Brainstorm adjustments as needed, and alter the first list accordingly. 6. Let go of the rest. During this last session, I said goodbye to two potential characters when I realized they didn’t add anything but trouble to this book (not the good sort of trouble), but I realized someone else–someone I’d originally thought would not play a role–could in fact play a vital part in the story. I also altered several storylines. 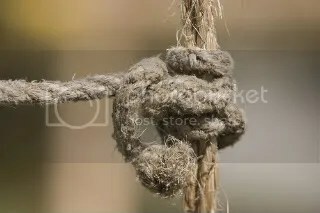 It seems simple, but when you have a knotty mess, it’s sometimes good to stop pulling the rope, analyze the knot, and take your time to straighten things out again. I’m curious . . . do you outline your book before you sit down to write? Do you think that would keep it from getting tangled up? .-= DL Hammons´s last blog ..Writers Toolbox =-. I’ve never seen this exercise before. I’ll have to give it a try (but at the same time hoping I won’t need to, haha). Thanks! .-= Lydia Sharp´s last blog ..Our Inescapable Culture =-. This comes at the perfect time for me. Thanks. That’s a super idea! And I have just the story to try it out on. Something I started, hit a dead end, and abandoned before writing the last WIP. But I know there’s something to salvage. DL, I’m a natural pantser, but I’ve adopted many of the ways of a plotter, to be more efficient. (I outline main points, but I have to leave other elements undiscovered or I find writing tedious.) What I’ve found is that, no matter what I think I know about my characters ahead of time, they will inevitably prove me wrong–revealing once again that I’m really a pantser. Thanks for comments, everyone. Richard and LJ, I hope it works for you too! Ditto to Lydia Sharp, haha. .-= Kristan´s last blog ..A for effort? =-. .-= Merry´s last blog ..The sun is shining in my eyes… =-. Exactly what I needed. Now. .-= PatriciaW´s last blog ..2009 Favorite "Other" Reads =-. Thank you very much for sharing your writing wisdom. I like your six steps & I’ve cut & pasted them into my writing folder. .-= RKCharron´s last blog ..Release Day Tuesday =-. Great idea. I did outline my book–extensively–but am still running into trouble with this. I think this exercise would really help me decide what to keep and what to drop in revisions. Good exercise. For my 1st draft of my WIP, I had ideas that I thought were brilliant and ended up being crap. Ditto for the 2nd through 4th drafts. It was painful to have to cut them. Painful but necessary. Along similar lines, I’ve always had problems cutting scenes/paragraphs/pages of actual writing. To me, even a paragraph represents a chunk of time in my life that I spent writing (often through days of sleep-deprivation thanks to my new baby). .-= Laura Droege´s last blog ..Grace: the song I long to hear =-. That’s excellent advice from Laura. I write very slowly, and it really goes against the grain to delete long passages, even when I know it’s necessary. I now cut and paste doubtful bits into a separate document ‘just in case’, and I do resuscitate some of them later. i don’t free-fall, i plan, but i still hit this wall. it often seems to happen at around 30,000 words – i think this is about having done what feels like a lot of work but not even being halfway through the story. and while i plan, it still doesn’t mean the story will fit into my word count. This sounds like a fantastic exercise, but I’m not sure I understand it. What do you mean by “Now, try to link them”? I’m one of those people who learn best by example. Would you be willing to show us an example of your paper? Or give one or two points whose purpose was suspect, and which were redeemed or rejected, and the process you used? .-= hope101´s last blog ..Naughty Santas, Nice Sentiments =-. Laura, I have a “cut scenes” file as well, and I agree with you that there’s something comforting in knowing words aren’t lost–even though you’ll probably never use them. hope101, for me, “linking” meant ensuring a valid connection existed between necessary characters/plot points/themes and those nebulous (and often troublesome) components. More often than not, I find problems creeping into my stories through secondary plots and characters. An example from my mess in progress: A secondary character’s sister became more and more present in the book. But this is not her story, and her plight was not linked strongly enough to the main plot or the themes of this book to warrant running with the thread. My solution? I didn’t want to continue fighting with the character, so I eliminated her from the cast. Her story can unravel in another book. I hope that made some sense, as I’m still recovering from an overdose of Christmas cookies. Therese, despite your baking-induced high, yes, thanks, this makes sense to me. Thanks for the example. .-= hope101´s last blog ..The Commiseration Post =-. Not about to give up! But the complexities of what I didn’t think necessary for the reader to know, but did, threw me. Creating new characters and writing I didn’t want to do. The knots, caused by ommision of information, have to be blended in and connected. Thanks Lynn for the pointers on how to blend and reweave. This is great — thank you! .-= Melanie´s last blog ..I Have a New Gig =-. That was a useful post thanks. I am in a knot at the moment. .-= Glynis Smy´s last blog ..Doing a U Turn =-. First off, congrats on your debut! That’s a huge accomplishment. The rub with marketing and publicity is that there’s rarely a way to connect efforts with sales, except through correlations. Yes, my sales were up while the Facebook ads were ongoing–and I did see plenty of links from Facebook directly to my website, which meant the ad was being viewed and people were responding to it. Did those views and clicks translate directly into sales? Or were sales coming from other ads, or as a response to interviews or articles or word-of-mouth? It’s impossible to say. But because of the number of click-throughs to my site–especially in comparison to click-throughs from much more expensive sites where ads were also placed (Perez Hilton, Go Fug Yourself, etc…)–I believe the money was well spent. If nothing else, it increased the book’s profile. And, yes, I would do it again.